October 15, 1909-June 19, 1990. A kind and gentle man of the highest intregrity, who served his country from the horse cavalry to the nuclear age." Samuel Gerson Nordlinger, whose military and civilian careers stretched from the waning days of the horse cavalry to the age of jet engines and atomic power died at Holy Cross Hospital in Fort Lauderdale, Florida. He was 80 and a 19-year resident of the area. He rose to the rank of Colonel in the United States Army and spent several years doing military-related research in pirvate industry and his ended his working years as chief of the technical services division of the US Atomic Energy Commission. He was born and raised in Washington, D.C. and studied for two years and the University of Pennsylvania, before graduating from the Massachusetts Institute of Technology. He served in the National Guard Horse Cavalry in Pennsyvlania and was commissioned in 1930 as a lieutenant in the United States Army. After gradute school at the University of Pennsylvania where he received a Master's Degree, he was assigned to the Civilian Conservation Corps. In 1937, he joined Shell Oil as a research engineer. He returned to active duty in 1941 with the US Army Air Corps in Dayton, Ohio, where he was chief of the section responsible for production of all military aircraft. He left the Army in 1947 and joined Fairchild Aircraft Company to work on the development of jet engines. He helped design the first engine used in American guided missiles. He joined the US Atomic Energy Commission and in 1967 was made chief of technical services. October 15, 1909-June 19, 1990. A kind and gentle man of the highest intregrity, who served his country from the horse Cav to the nuclear age. 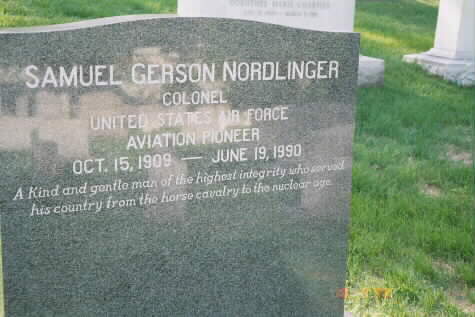 Samuel Gerson Nordlinger, whose military and civilian careers stretched from the waning days of the horse cavalry to the age of jet engines and atomic power, died on Tuesday, June 19, 1990, at Holy Cross Hospital in Fort Lauderdale. He was 80 and a 19- year resident of Fort Lauderdale. Colonel Nordlinger rose to the rank of Colonel in the US Army, spent several years doing military-related research in private industry and ended his working years as chief of the technical services branch of the US Atomic Energy Commission. He retired in 1971 and moved to South Florida, where he was active with the US Power Squadron and the U.S. Coast Guard Auxiliary. "I think he was absolutely fascinated by technology, and I can't think of someone who had more opportunity to see the development of technology," said Nordlinger's son, Gary Nordlinger of Washington, D.C. Colonel Nordlinger was born and raised in Washington, D.C., and studied for two years at the University of Pennsylvania. He graduated with a bachelor of science degree from the Massachusetts Institute of Technology and a master's degree in engineering from The Pennsylvania State University. He had served with the National Guard Horse Cavalry in Pennsylvania and was commissioned in 1930 as a Lieutenant in the US Army. After graduate school he was assigned to the Civilian Conservation Corps. In 1937 he joined Shell Oil as a research engineer, working on classified research in aviation, fuels and engines. In 1940, he headed production testing at Continental Motors in Detroit, which supplied military aircraft engines to Britain. Colonel Nordlinger returned to active duty in 1941 with the U.S. Army Air Corps in Dayton, Ohio, where he was chief of the section responsible for production of all military aircraft engines. Later in the war, Nordlinger served as chief aircraft engineer in the India-China theater, working to fly tons of military supplies over the Himalayas into China. He worked with General William Tunner, who later commanded the Berlin airlift. In 1946, Mr. Nordlinger left the Army and joined the Fairchild Aircraft Corp. to work on the development of jet engines. He helped design the first engine used in US guided missiles. Nordlinger joined the U.S. Atomic Energy Commission in 1957, serving as chief of the engineering division during the development of reactors for nuclear submarines, weapons production and civilian and scientific use. He was named US Atomic Energy attache to Great Britain in 1962 and in 1967 was made chief of technical services. Survivors include his wife, Sally Haines Nordlinger of Fort Lauderdale; two sons, Robert Nordlinger of Melbourne, Australia, and Gary; and two granddaughters. Private services will be on Monday in Arlington, Virginia. Burial will be in Arlington National Cemetery.